Available in print as 5 Volume Set or as individual volumes. Buy the Set and SAVE 30%! 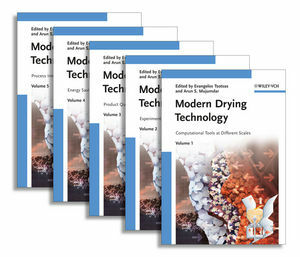 Volume 1: Diverse model types for the drying of products and the design of drying processes (short-cut methods, homogenized, pore network, and continuous thermo-mechanical approaches) are treated, along with computational fluid dynamics, population balances, and process systems simulation tools. Emphasis is put on scale transitions. Volume 2: Comprises experimental methods used in various industries and in research in order to design and control drying processes, measure moisture and moisture distributions, characterize particulate material and the internal micro-structure of dried products, and investigate the behavior of particle systems in drying equipment. Key topics include acoustic levitation, near-infrared spectral imaging, magnetic resonance imaging, X-ray tomography, and positron emission tracking. Volume 3: Discusses how desired properties of foods, biomaterials, active pharmaceutical ingredients, and fragile aerogels can be preserved during drying, and how spray drying and spray fluidized bed processes can be used for particle formation and formulation. Methods for monitoring product quality, such as process analytical technology, and modeling tools, such as Monte Carlo simulations, discrete particle modeling and neural networks, are presented with real examples from industry and academia. Volume 4: Deals with the reduction of energy demand in various drying processes and areas, highlighting the following topics: Energy analysis of dryers, efficient solid-liquid separation techniques, osmotic dehydration, heat pump assisted drying, zeolite usage, solar drying, drying and heat treatment for solid wood and other biomass sources, and sludge thermal processing. Volume 5: Dedicated to process intensification by more efficient distribution and flow of the drying medium, foaming, controlled freezing, and the application of superheated steam, infrared radiation, microwaves, power ultrasound and pulsed electric fields. Process efficiency is treated in conjunction with the quality of sensitive products, such as foods, for a variety of hybrid and combined drying processes. Professor Arun S. Mujumdar has been Professor of Chemical and Mechanical Engineering at the McGill University, Canada, and at the National University of Singapore. He has authored 2 books and over 60 book chapters, edited or co-edited over 50 books including the Handbook of Industrial Drying. Member of various professional and scientific associations, he was recently conferred Doctor Honoris Causa by the Technical University of Lodz, Poland, and the University of Lyon, France.